Have you been out to San Francisco International Airport yet to see “When Art Rocked: San Francisco Music Posters, 1966 – 1971“? Well, if the 162 posters and 100 or so postcards and handbills on display there are not enough to entice you, how about a free panel discussion and reception with some of the artists in the show? 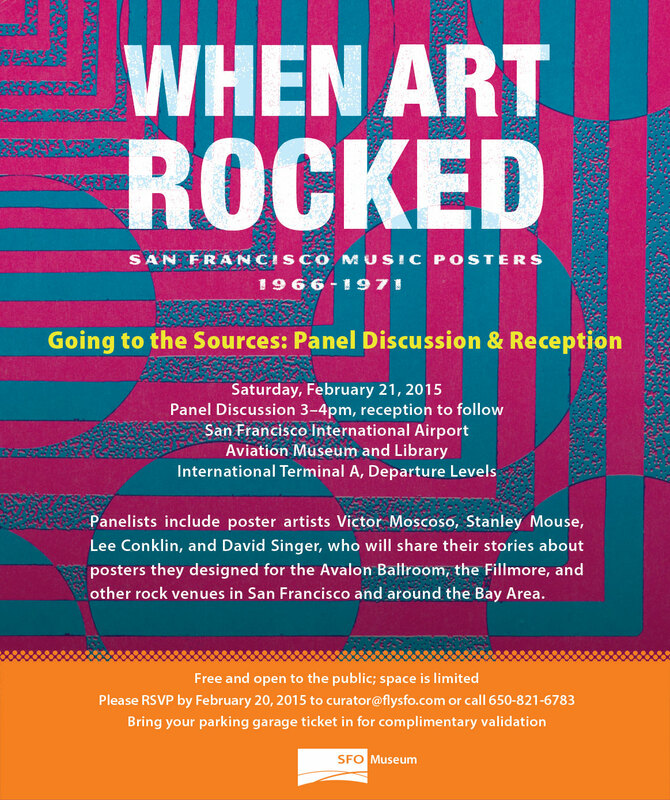 That’s what’s happening on Saturday February 21 at 3pm, when SFO will host an afternoon devoted to late-1960s rock posters at its Aviation Museum and Library, located in the International Terminal, just steps away from the “When Art Rocked” exhibition itself. The panel will feature artists Stanley Mouse, Victor Moscoso, Lee Conklin, and David Singer —”When Art Rocked” guest curator and TRPS vice-president Ben Marks will attempt to moderate. After the panel, visitors will be invited to hang around, sip and snack, and check out the exhibition. Space is limited, and parking will be validated, so RSVP today! Simply send an email to curator@flysfo.com or call 650-821-6783. To learn more about the show, visit SFO Museum, or read the article Ben wrote on Levon Mosgofian, whose company, Tea Lautrec Litho, printed most of the posters for Bill Graham back in the day. Ruth Kelly liked this on Facebook. will any of the artists be available to sign posters? Sutton Shealy liked this on Facebook. Ben Abbott liked this on Facebook. Silvio Demétrio liked this on Facebook. David J Lipschultz liked this on Facebook. Neil Canfield liked this on Facebook. Samuel Amezquita Sahagun liked this on Facebook. Victor Sam liked this on Facebook. Mike Deadheaddaddy Reardon liked this on Facebook. Jérôme Brunet liked this on Facebook. Guy Miller liked this on Facebook. Michael Adler liked this on Facebook. Wish I could be there…. Jennifer Davis Garness liked this on Facebook. Elizabeth Ann Ploeger liked this on Facebook. Matt Schilling liked this on Facebook. Yolan Presley liked this on Facebook. John Bertrand liked this on Facebook. Brian Brewton liked this on Facebook. Brian Prindle liked this on Facebook. Ann McGlynn liked this on Facebook. Peter Wiley liked this on Facebook. Gary Shull liked this on Facebook. Robert Greene liked this on Facebook. Kyler Sharp liked this on Facebook.